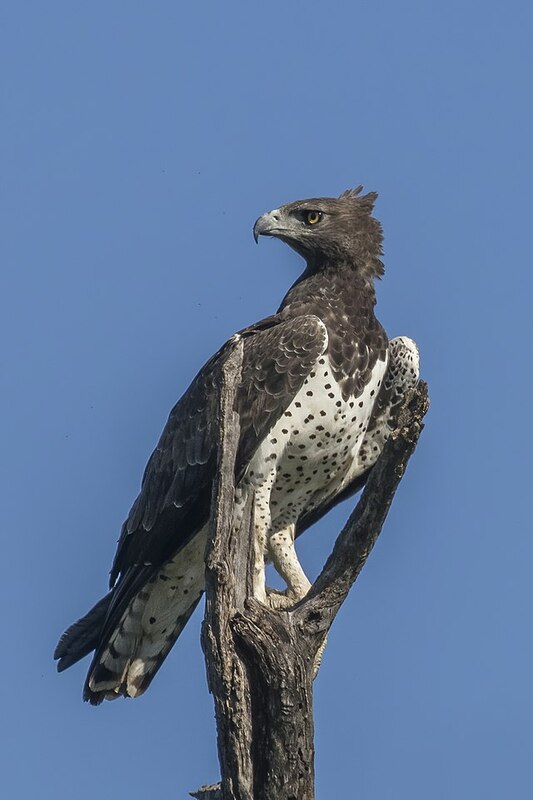 The martial eagle is a very large eagle, with an average length of 78–96 cm (31–38 in), weight of 3–6.2 kg (6.6–13.7 lb) and a wingspan of 188–260 cm (6 ft 2 in–8 ft 6 in). Its total length - in comparison to its wingspan - is restricted by its very short tail. Among standard measurements, the wing chord is 56–67.5 cm (22.0–26.6 in), the tail is 27.2–32 cm (10.7–12.6 in), the tarsus is 9.7–13 cm (3.8–5.1 in). This is the largest eagle in Africa and is the fifth heaviest (on average) eagle in the world. This eagle can be found throughout the African savanna, in any type of terrain, from mountain to flat plains, and from the edge of deserts to wooded country. Martial eagles are commonly seen perched on tall dead trees. They spend much of their time flying at such a height that it is impossible to see them, even with good binoculars. They hunt from the air, diving at great speed onto their prey. An impressive and fearsome-looking bird, it can bring down an impala, though it usually takes much smaller prey, especially sandgrouse, francolins and other ground-dwelling birds. It also takes mongoose, squirrels, hares, small antelope, Guineafowl, lizards and young ostrich. The bearded vulture (Gypaetus barbatus), also known as the lammergeier or ossifrage, is a bird of prey and the only member of the genus Gypaetus. Traditionally considered an Old World vulture, it actually forms a minor lineage of Accipitridae together with the Egyptian vulture (Neophron percnopterus), its closest living relative. It is not much more closely related to the Old World vultures proper than to, for example, hawks, and differs from the former by its feathered neck. Although dissimilar, the Egyptian and bearded vulture each have a lozenge-shaped tail — unusual among birds. This bird is 94–125 cm (37–49 in) long with a wingspan of 2.31–2.83 m (7.6–9.3 ft). It weighs 4.5–7.8 kg (9.9–17.2 lb), with the nominate race averaging 6.21 kg (13.7 lb) and G. b. meridionalis of Africa averaging 5.7 kg (13 lb). In Eurasia, vultures found around the Himalayas tend to be slightly larger than those from other mountain ranges. Females are slightly larger than males. It is essentially unmistakable with other vultures or indeed other birds in flight due to its long, narrow wings, with the wing chord measuring 71.5–91 cm (28.1–35.8 in), and long, wedge-shaped tail, which measures 42.7–52 cm (16.8–20.5 in) in length. The tarsus is relatively small for the bird's size, at 8.8–10 cm (3.5–3.9 in). The proportions of the species have been compared to a falcon, scaled to an enormous size. Like other vultures it is a scavenger, feeding mostly on the remains of dead animals. It usually disdains the actual meat, however, and lives on a diet that is typically 85–90% bone marrow. Live prey is sometimes attacked by the bearded vulture, with perhaps greater regularity than any other vulture. Martial eagke will usually win as it has more formidable talons and a stronger beak. 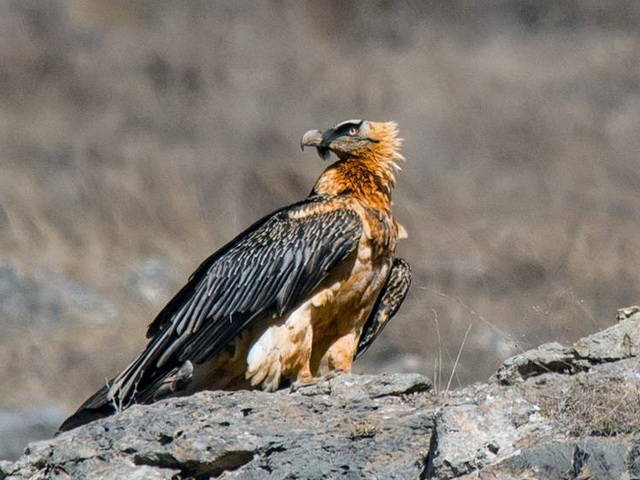 The bearded vulture which will give it a good fight when it comes to bones or protectung its nrst. At food sources, it will give way. martial eagle larger and more powerful beak with massive talons, however eagle has more chances to win this fight until bearded vulture has size advantage.